Today I want to write about the pygmy hippopotamus as not many people know much about them compared to the much larger hippos. The pygmy hippopotamus is only about a fifth the size of the common hippopotamus, weighing up to 275 kg and measuring 1.75 metres in length. 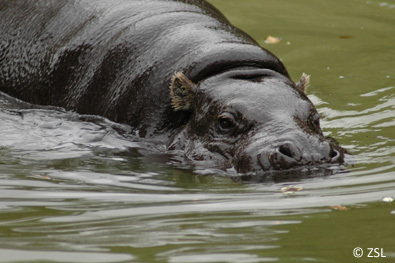 Along with the obvious difference in size, the other big differences between the two kinds of hippos is that the pygmy versions have their eyes on the sides of their head, not on top and their feet are not as webbed. They have to stay in or near water as their skin loses moisture at up to three times the rate of humans. The pygmy hippopotamus can sleep underwater and has a special reflex that allows it to float to the surface, take a breath and drop down again without waking up. Found in the western African nations of Liberia, Sierra Leone, Guinea and the Ivory Coast, the pygmy hippopotamus is endangered due to deforestation and poaching and there may be only 3,000 left in the wild. They are easily bred in zoos, but more needs to be done to protect them in the wild. Are there any other interesting facts that you would like to share about pygmy hippopotamuses?